The restaurant at this hotel is more like a 2 star, the buffet on the night we tried it was near on pathetic and the snacks were at best 3* quality. The hotel was kept very clean and it was hard to spot the hotel without a cleaner on site - they were everwhere and sometimes cleaned our room twice in one day! Location is AT LEAST 20 MINS walk from either resort and this is for someone who walks fast - get a taxi - only 5 euros and your on your holidays after all. Hotel staff ok, the English guys especially Steve was great it was mainly the Spanish employees - sometimes rude. The Thomson reps brilliant, especially Super Duper Dawn - her enthusiasm for job was brilliant. Entertainment was very good and if you have done Family Club Extra before it is what is expected - 24 reps and LOTS to do. We would recommend the hotel, but would say that Alykanas Village (Thomson FamilyClub Extra) is better than Villa Mandi. Last visited four years ago and not much has changed, excellent hotel located 15-20 minutes stroll from centre of Los Christianos andeast part of Playa de las americas. Thomson family hotel and all kids enjoyed the club sessions, 10.00-12.00 under 5's and 13.oo-15.00 6-8's and 9-12's, plus other sessions in evening and/or pay sessions. Usual collection of activities, kids disco etc etc and of course Thomson the dog !!! Pool and sunbeds were plenty but may be hard to get when the hotel is full. I guess it was probably only 70% full this week. Apartments were excellent size and probably biggest we have found anywhere, we had no323 which was fab with views of golf course, big balcony and roof terrace. I would also recommend 322/324 or 325. Staff very good, knowledgeable and happy to help. My wife and I stayed at the 4 key Villa Mandi complex for 2 weeks in mid-May and had a very enjoyable holiday. Our spacious 1-bedroomed air-conditioned apartment was on the first floor in the quieter lower part of the complex overlooking the area where the small playground is situated which suited us fine. The living area contained a dining table and 4 chairs and a kitchen area with the usual 2-ring hob, fridge, microwave oven, electric kettle and toaster as well as enough utensils, crockery and cutlery to allow basic self-catering for 4 people. The air-conditioning only cuts in when the patio door is closed. The bathroom has two washbasins and a bath with an overhead mixer tap shower. It was also equipped with a hairdryer. Our balcony was nice and big with sun on it from late morning through to sunset at this time of year. Although there is a patio set of 4 chairs and a table on each balcony, no sun-loungers are provided. I found this hotel exceptionaly clean and tidy the staff really earn there pay, i feel that anyone who writes a bad review about this hotel is just too fussy we had 2, 2 bedroom apartments and wouldnt go back to a one bedroom ever again the apartment was very spacious and very clean the maids came every day with clean towels. We arrived at Villa Mandi with our 1 year old twins after a very early morning flight from Manchester. On arrival we were allocated room 116 which was a one bedroom apartment on the pool side. When we realised that we would be in the same room as the twins cots we decided to upgrade to a 2 bedroom apartment, and this was much more spacious. (302, I think!) The second apartment was on 2 floors with a bedroom and a bathroom on each floor. The upstairs terrace was huge and could have easily fitted sunbeds and a hot tub on, which seemed like a missed opportunity for the place, as they could have charged loads for the room then! As it was we carried up 2 of our chairs from the downstairs balcomy and had many an enjoyable evening waching the sun go down on the golf course. Cleanliness was spot on, although we did have a bit of an ant problem when we got there which was rectified after buying ant spray in the supermarket!!! Oh and with having two crawlers I did notice the floor could have been mopped a bit more. The entertainment team were FAB!! Just make sure you go here wanting to join in! Dawn and Phillippa by the pool were really friendly and always made a point of coming to talk to the twins. All the lovely ladies in the kids zone were great, Louise, Steph, Leanne, Michelle, and all the others whose names have escaped me! We thouroughly enjoyed taking the twins to toddlerzone 3/4 times a week, and they made their holiday when Thomson the Dog came out at lunchtime by the pool for storytime. The facilities for families were first class, there were 2 outdoor play areas, 4 pools, including 2 baby pools. The snack bar by the pool was great, Paulina came and chatted to the twins every day, and gave them lollipops, which they had never had before we went here! As for supermarkets, make sure you buy the basics at the Villa Mandi one and walk to the Hyper Trebol across the wasteland in front of the hotel, its where all the locals seemed to stock up and was the most reasonable we found, just make sure you put your bag in the locker or the man will tell you off! This was our 2nd visit to the Villa Mandi. The rooms are of a really good size and our view overlooked the golf course behind. The room was cleaned and beds made every day. If you want clean towels every day you can have them. You can also hire Thomson towels from Reception with a 10euro deposit per towel and you can swap them for new towels every day. The pools are lovely and the main big one is heated. They open at 9am so you can stand near your preferred sunbeds and brolly and then reserve your beds from 9am. The snack bar is a little expensive but generally good food. The restaurant has a good menu and the service is good. There is a supermarket on site which again is a little expensive but is conveniently located. The reps all work hard and are available throughout the day. Our 8 year old went to Team Kids' Club and really enjoyed it. The evening show was hit and miss. We enjoyed the snake show and magicians/comedians but some of the singing/dancing groups were fairly bad. However, evening entertainment isn't really our thing we were mainly there for mini disco (good fun for the kids). 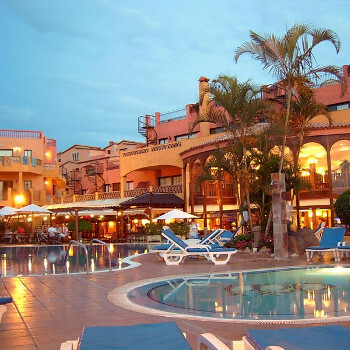 The hotel is located outside of the resorts and is probably a 20min walk into Los Cristianos and 15min into Playa de las Americas. We encountered no problems on our holiday and would highly recommend the Villa Mandi. We arrived at the hotel after a short transfer from the airport and found the reception staff were very efficient at checking in all new arrivals. We stayed in room 201 which appeared to be one of the largest one bedroom apartments (I had previous emailed the hotel and asked for a room with a pool view). The only negatives with the room were that they are starting to look a bit tired. The cleaners visited 6 days per week and were very good. The hotel itself was very clean with grounds staff constantly working on one thing or another (but not getting in our way). The evening entertainment was at best average. Firstly, all evening entertainment was held inside. The few acts that we saw were all 60's music acts. We have previously gone to a few First choice holiday villages and if kids entertainment is a priority then book one of these. We only went on one excursion during our stay, this was to Loro Parque. I must say that this is very expensive but worth every penny. Best excursion that I have ever been on, a must in my opinion. The hotel restaurant was very poor, the meals were very bland and the staff was terrible. I must say that this was the worst part of the hotel complex. All other negatives with this hotel are just a personnel opinion and I can understand why others may disagree with me but most people agreed that the restaurant was very poor. We went for 1 week in May, half board. It was great for the kids. The Thomson reps were A1. The food was quite good but the menu was a bit repetetive. Only 10 min walk to Los Christianos. If you get a taxi watch the price on the meter, should cost about 5 to 6 euros. One taxi tried to charge me 9 euros before a tip told him where to go then changed price to 6 euros! I would definatly recommend this complex if you have kids they have their own club on site where the reps take them off your hands for 2 hours in the day & 2 hrs in the evening. We are a family of 2 adults and 3 children, we went self catering and flew with Thomsonfly, the apartments are very spacious with the 2 bedroom apartments having an upstairs and downstairs, the downstairs has 2 single beds with a large wardrobe, living area, kitchen and a large bathroom with, bidet 2 sinks, toilet and a shower, there is also a small balcony with a patio set, the upstairs has 2 single beds, and a bathroom the same as downstairs, the apartment has air conditioning through out and a hairdryer up and downstairs, there is also a safety deposit box, tv and phone, the pools are great and staff are very friendly especially the kids reps, the entertainment is good too, the only thing is that you have to walk about 15-20 minute before you come to any sort of entertainment and supermarkets, you can also get a taxi into playa de las americas for around 6-8 euros where there are good restraunt and bars. We spent most of the time on our roof terrace to be honest which was excellent. Didn't try the food as we were self catering and ate out all the time apart from breakfast in the room. 15 mins exact to Las Americas - i know this as i timed myself from leaving apts to getting to Linekers bar in time for watching a prem game. Staff all good, english lad on reception very helpful.